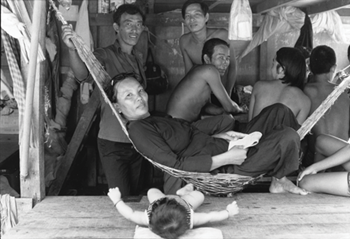 Some 141 Vietnamese refugees had resettled in Northern Ireland by 1980. Emma Blee reveals some of the details contained in government files. While the bulk of the Northern Ireland population would show “traditional hospitality” to a limited number of Vietnamese refugees, NIO Minister Philip Goodhart thought the response would be warmer if the province was not meeting the “full cost”. He made the statement in 1979 after the Vietnam War prompted a wave of immigration from the country. In 1979, the Government decided that Northern Ireland would do what it could to help the refugees. During correspondence on the issue in June 1979, NIO Minister Hugh Rossi suggested the “patching up” of the recently built but largely vandalised flats in Ballysillan, North Belfast, to accommodate refugees. Save the Children suggested that anyone moving to the province should be briefed on issues such as terrorist violence. The organisation put forward proposals to organise a refugee camp where families would live for four months. However, Ken Bloomfield, the Department of the Environment’s Permanent Secretary, was sceptical of the plans, stating that this could be interpreted as government “imposing” refugees on the region, which could provoke hostile reactions. Eventually it was decided that the Ballysillan plans would not go ahead due to the “unsettled nature” of the area and “uncertainty about community support” for the project. In a letter dated 20 July 1979 to all district councils, the department stated that the province would “where practicable, play its part in the general resettlement arrangements”. It suggested that 15 families should be invited to resettle in Craigavon. The decision was made in light of the “acute problems being raised in South-East Asia through the flight of refugees from Vietnam”. Voluntary organisations such as The Ockenden Venture, Save the Children Fund and the British Council for Aid to Refugees would bring refugees into specially equipped reception centres across the province where their basic needs would be met. There would be a familiarisation period of between three and six months and individuals would then be given permanent housing and resettled in family groups within the general community. This would last around nine months. The letter suggests that most refugees could attain independence within 19 months of their arrival. According to a memo by Ken Bloomfield to Philip Goodhart in 1979, the project was proving to be successful as all 15 families were “merging effectively” into community life. At least one member of each family had found a job and a number of others were in training. Children of school age and a number of adults were attending the local Brownlow High School or were receiving a home tutor service. By July 1980 there were 28 refugee families in the province with 141 people resettled. Some 15 families were in Craigavon, five families were living in Coleraine and five in Ballymena, while three had settled in Lisburn. The Housing Executive indicated that 10 more houses were available in Craigavon and further resettlement “would seem appropriate”. However, the Craigavon Area Council for Aid to Refugees said they would not accept responsibility for sponsorship. Save the Children Fund said there would be enough support for the project, even if it was from outside the Craigavon area. Bloomfield advised that each district council should be informed about the proposals “since a further resettlement may be seen locally as imposing unreasonably on the employment market”. Reference: FIN/18/59/4 (Public Record Office of Northern Ireland). Airey Neave was due to take the post but was assassinated by the INLA just before the 1979 election. Atkins increased police numbers and undertook two political initiatives: a constitutional conference and a proposed regional advisory council. Both proved unsuccessful and he left for the Foreign Office in 1981, but resigned on the outbreak of the Falklands War. Atkins joined the Lords as Lord Colnbrook in 1987. He died in 1996. Alison was Atkins’ deputy and was seen as a ‘toughie’ for siding with the prison officers during the hunger strikes. Later in 1981, he was appointed as UK Employment Minister. Alison was also Parliamentary Private Secretary to Margaret Thatcher from 1983 to 1987. He died in 2004. Rossi was a Minister of State at the NIO and later UK Social Security Minister (1981-1983). He was a Catholic ‘one nation’ Tory and was dropped from the Government after the 1983 election. In 1990, he was appointed Chairman of the Commons Environment Committee. He retired in 1992. Elton moved to Whitehall’s Department of Health and Social Security in 1981 and the Home Office in 1982. He later served in the Home Office (1984-1985) and the UK Department of the Environment (1985- 1986). A hereditary peer, he continues to sit in the Lords and keeps up an interest in juvenile justice and education. A former Fleet Street journalist, Goodhart had chaired the Conservative Party’s Northern Ireland Committee while in opposition. He was later a junior Defence Minister (1981) and a trustee of the Friends of the Union group. Goodhart retired from the Commons in 1992. Shaw oversaw the downsizing of Harland and Wolff but, according to his Guardian obituary, was “over-optimistic about De Lorean’s car scam”. He moved to the Department of the Environment (1981- 1984), Home Office (1984-1986) and Department of Trade and Industry (1986- 1987), but was then dismissed, probably due to his ‘wet’ leanings. He died in 2000. William Ewart Bell was appointed Head of the Civil Service in 1979. A son of the manse and former Irish rugby international, he retired from the Civil Service in 1984. He was later an Ulster Bank Director and IRFU Chairman. Sir William was knighted in 1987 and chaired the 1995 Rugby World Cup in South Africa. He died in 2001.